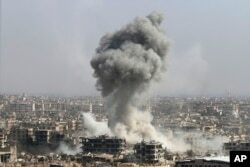 FILE - Smoke is seen rising over Saif Al Dawla district, in Aleppo, Syria. Thousands of Syrian villagers are fleeing homes in the countryside south of Aleppo in the face of a government ground assault backed by Russian airstrikes, one of four major offensives mounted since Russia’s military intervention in the long-running Syrian civil war. The three other offensives are focused mainly on rural areas in the provinces of Homs, Hama and Latakia. Three weeks into the Russian air campaign, no ground assault has been launched by government forces in major rebel-held urban areas. Militia commanders say they suspect the strategy of the government of President Bashar al-Assad is focused on stretching the rebels, seizing control of key highways and encircling larger insurgent-held towns in northern Syria. In the countryside south of Aleppo U.N. officials estimate about 35,000 villagers are on the move, escaping relentless and often indiscriminate Russian bombing raids around the villages of Khan, Tuman and al-Hader. Zaidoun al-Zoabi, head of the Union of Syrian Medical Relief Organizations, estimates the numbers of fleeing villagers are higher. In an interview with the BBC, he said several villages he had visited in Aleppo’s countryside were empty. “We saw only people who do not have even tents, any shelter, whatever. People were asking for some food, sandwiches even. There is no medical support,” al-Zoabi said. He estimates the number of displaced at about 70,000 people. “The shelling is so fierce. The sky was filled with jet fighters, with helicopters, and people are terribly scared. They are scared to death,” he added. Government forces, backed by foreign Shi'ite militiamen, remain stalled with their offensives in Hama and Homs, partly thanks to a U.S. resupply of anti-tank TOW missiles, rebels say. FILE - Syrian soldiers fire return fire, repelling an attack in Achan, Hama province, Syria, Oct. 11, 2015. 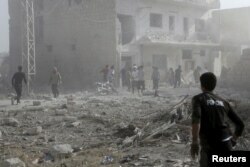 But the offensive in the Aleppo countryside that started Friday is seeing some early government gains. The ground offensive around Aleppo is believed to have been planned by General Qasem Soleimani, the commander of the Quds Force, the elite branch of Iran's Revolutionary Guards, who reportedly traveled earlier this month from Latakia with Russian military commanders to al-Safira to plot the early phases of the offensive. 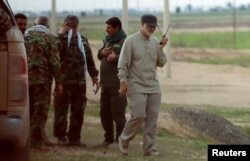 Soleimani had been a frequent sight in Iraq, where he had been advising Iraqi forces fighting the Islamic State group, according to a Washington Post report Monday. But with the war there stagnated, a shift of the commander, as well as Quds Force members and Iraqi militiamen, to Syria appears to signal a change in Iranian priorities, the article stated. U.S. Senator John McCain told VOA's Persian news service Tuesday that Soleimani was behind sending copper-tipped IEDs into Iraq. Earlier this month, in testimony before the Senate Armed Services Committee, Marine General Joseph Dunford, chairman of the Joint Chiefs of Staff, testified the explosives were responsible for the deaths of 500 U.S. soldiers and Marines in Iraq. FILE - Iranian Major General Qassem Soleimani uses a walkie-talkie at the front line during offensive operations against Islamic State militants in the town of Tal Ksaiba in Salahuddin province, Iraq, March 8, 2015. “So now we are seeing Mr. Soliemani [hopping] around different places, including a visit to Moscow and orchestrating activities in Iraq," McCain said. Rebel commanders with Fatah Halab (Conquest of Aleppo), a joint operations room bringing together 31 insurgent factions, concede they are taking heavy casualties south of Aleppo, among them Ismail Nassif, one of the founders of Harakat Nour Al-Deen Al-Zinki, a militia that has received U.S. supplies and training. McCain has previously urged U.S. President Barack Obama to establish a no-fly zone in Syria to protect Syrians from the Assad government's barrel bombing, a position supported by former Secretary of State Hillary Clinton and David Petraeus, the former U.S. Army general who led the "surge" in Iraq. FILE - Residents inspect a site damaged by what activists said was a barrel bomb dropped by forces loyal to Syria's president Bashar Al-Assad in Maarat Al-Nouman, south of Idlib, June 8, 2015. Speaking on the condition of anonymity, he added: “I don’t believe the government forces are succeeding very well. The rebels have received resupplies of TOW missiles and they are proving very effective against Assad’s tanks. Rebel commanders say the TOWS have been making a major difference for them. 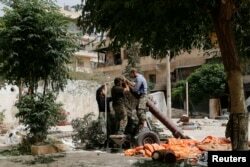 “We received more supplies of ammunition in greater quantities than before, including mortar bombs, rocket launchers and anti-tank [missiles],” Issa al-Turkmani, a commander in the FSA-affiliated Sultan Murad group fighting in the Aleppo area, told Reuters. Fierce fighting has been seen east of Aleppo city in the Azzan Mountains, where government forces, in coordination with the regime's Iranian-trained irregular National Defense Forces, have been pressing Islamic State militants in a bid to lift a two-year siege of the Kweiris air base. Syrian government forces have also been attacking al-Harariya power plant, which was bombed Sunday by U.S. planes, testimony to the overlapping multilayered conflict raging in Syria. While the U.S. strike appeared to help Assad’s forces in the battle for the power plant, Russian warplanes wrecked a hospital in the village of al-Hader that has been funded by the United States, local residents say. Newborn babies had to be evacuated. The hospital in Khan Tuman was also severely damaged by Russian bombs. Meanwhile, pro-opposition monitoring group the Syrian Observatory for Human Rights and other political activists reported high casualties from several Russian airstrikes in Jabal al-Akrad in the northern Latakia countryside, with up to 127 civilians, including women and children, killed and wounded. Among the dead, the monitoring group said, was rebel commander Basel Zimmo, who was chief of staff of the First Coastal Division, another U.S.-backed rebel militia. VOA's Persian News service contributed to this report.